Welcome to Monday all , today we are going to review a new author to me and his book. Lets hop into I WALTER by Mike Hartner . Young Walter Crofter is desperate to escape his working-class family and its bleak future. After sneaking off and joining the Merchant Marines, Walter sets sail for a new adventure -- and a new destiny. He faces challenges both at sea and on land. There are pirates to fend off, trade routes to establish, and lives to change. This is my first book by this author and man I must say I truly enjoyed reading . The author takes us on an adventure that will have you turning pages all night long . You can almost hear the wind in the sails and the clanging of the swords . I really enjoyed the story and honestly felt like I was transported back to the 1700's . 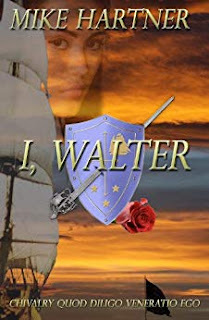 I Walter is that book for those who love historical books that has swash buckling characters . romance and some intrigue . With lovable characters and a great back drop . This is the story for you . So if you want a book that will keep you up all night reading this is the book for you .